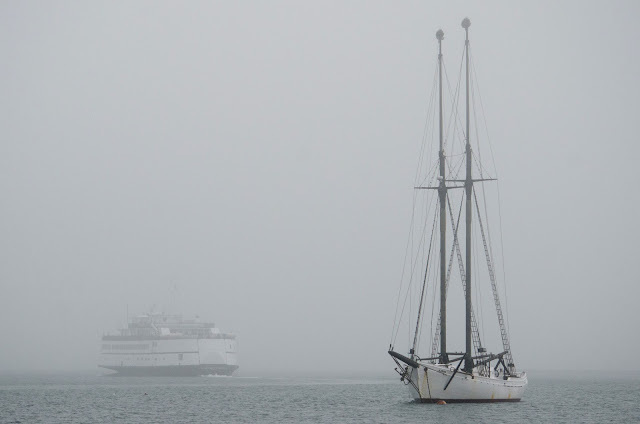 We get some fog on Martha's Vineyard, though not as much as Maine. It was really thick this afternoon in Vineyard Haven Harbor. I was hoping the M/V Martha's Vineyard would slide into position behind the schooner Alabama, and the shot came together for a few seconds. This was around holiday time, because Alabama is flying small evergreen trees from her topmasts. It's an old seafaring tradition that dates back hundreds of years. Purchase this photograph (or at least see what it looks like with a black frame and white matte).